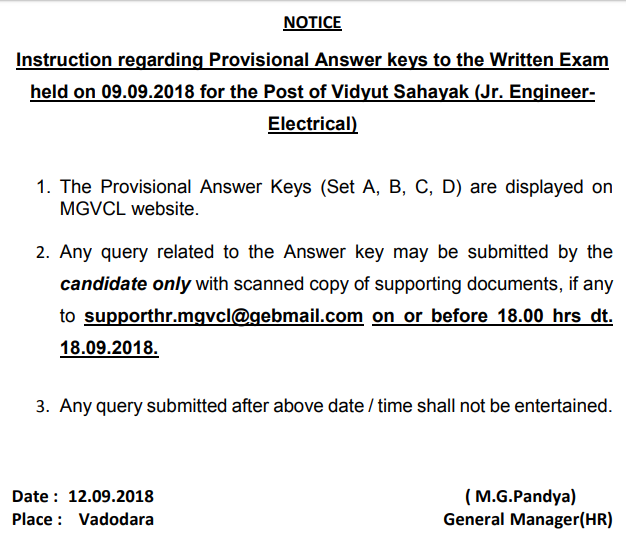 MGVCL Answer Key 2018 Out For Vidyut Sahayak (Junior Engineer Electrical) – Finally on URL – www.mgvcl.com/jobs.php, as a part of good news on official website of Madhya Gujarat Vij Company Limited, Answer Key for Written Test held on 9th September 20108 for the post of Vidyut Sahayak (Junior Engineer Electrical), MGVL is now available to download. 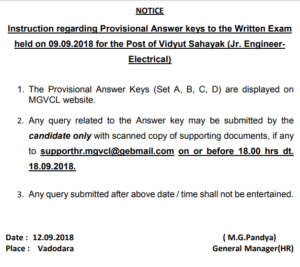 Answer Keys are released separately for Set A, B, C and D according to MG Pandya who is General Manager. If candidates want to raise the objections against the official Answer Keys then they should do it before 1800 hours before 18th September 2018 on email address [email protected] also they should send the proof as well. In accordance with Junior Engineer Electrical Syllabus of Vidyut Sahayak post, question paper was prepared mainly from five sections i.e. General Knowledge (having ten per cent marks weightage), similary ten percent for English Knowledge, sixty per cent for Electrical Engineering, ten per cent for Computer Knowledge and ten per cent for Gujarati Language and Grammar. Since this total hundred marks question paper was Electrical Engineering biased following which it was concluded that section III i.e. Electrical Engineering included topics like Analysis of Dist. Transformers, Meters and Testing, Distribution Network Installation and Load Studies, Power Engineering, Functions of Capacitors and Reactors, Measurement of Electrical Power, Performance of line fault analysis, present power sector scenario in India and other electrical engineering topics etc., non-conventional energy sources like Wind, Solar, Biomass etc, low voltage constraint and resolving thereof, distribution high tension/ low tension line parameters and switchgear and protection (MC/ LV) & LT switchgear design and testing etc.